I must admit, I seem to have an odd fetish when traveling. Every time I go to a new place there is something unique that seems to gravitate to me. In China, it was the exotic foods. In Morocco, the goods at the souq. In Nepal, the prayer flags. So what was it when I was in Guatemala? 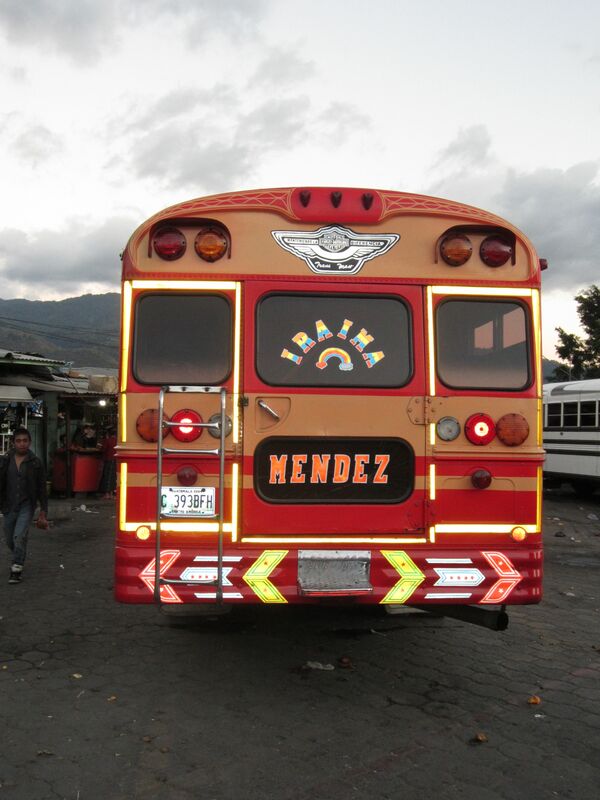 Hands down the funky, multi-colored Guatemalan Chicken Buses that grace the roads and streets throughout the country. 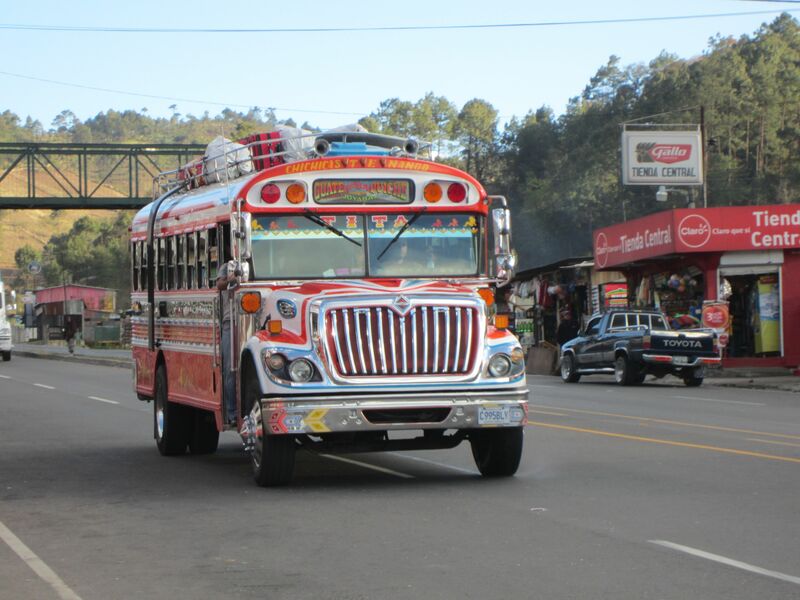 Known as “las camionetas“, the Chicken Buses are decommissioned American school buses that are sent on a long journey south to poor countries in Central America, where they are repainted, refurbished and act as the main source of transportation for the Guatemala’s 13.8 million people. 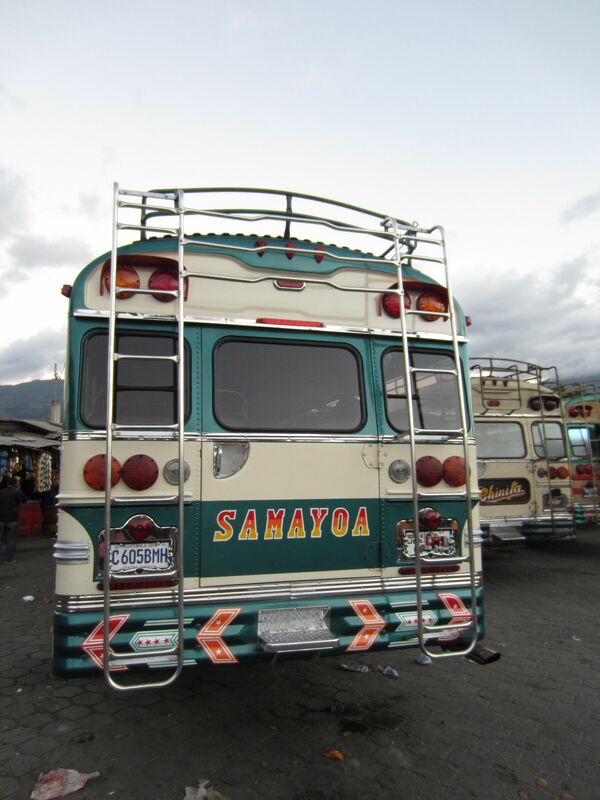 While researching my trip to Guatemala, I had read about the much loved and hated Chicken bus. 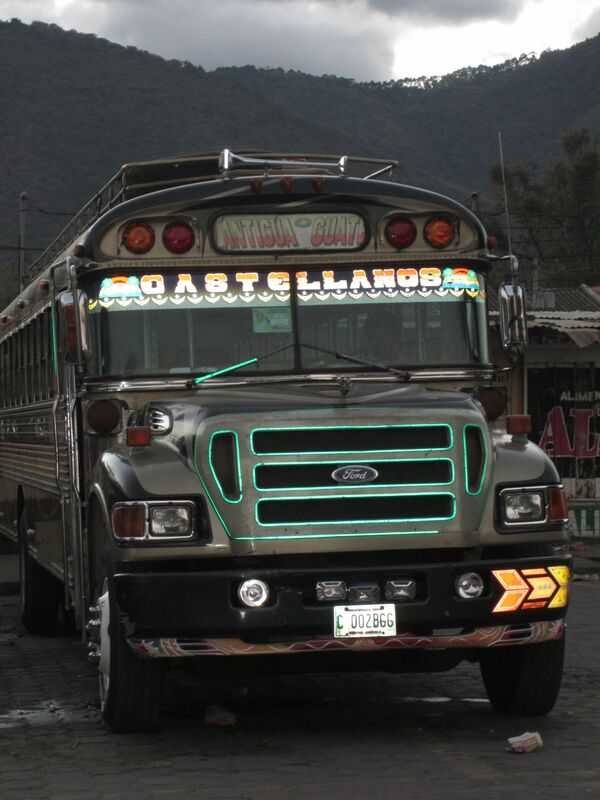 I even googled it and found several silly pictures of these elaborately decorated buses. I knew that they were cheap, relatively reliable and safe (that is for the most part) but I wasn’t sure where the name came from and whether or not there would be real, live chickens on board. The origin of the name still remains a bit of a mystery to me today as I never did see anything except people on board. 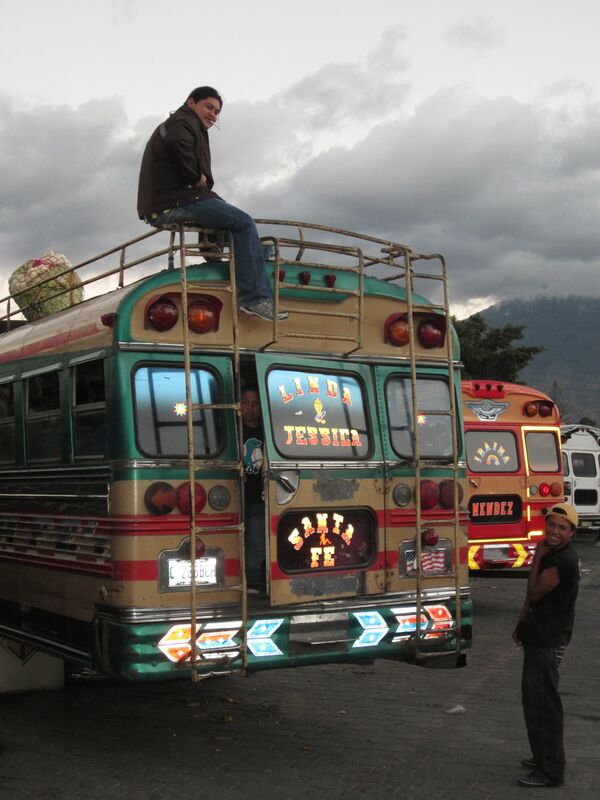 Then again, I only got to actually ride inside one chicken bus so that is perhaps not very good odds. 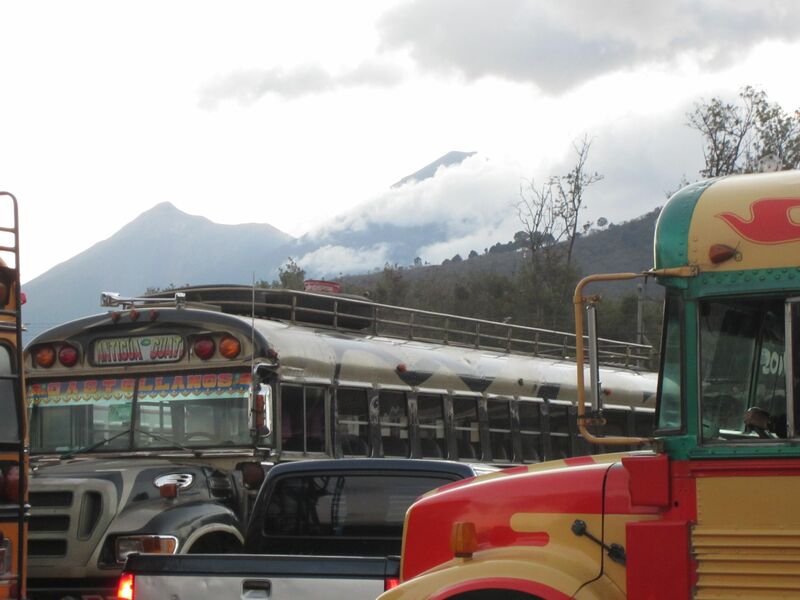 Today, while I was tooling around on the internet, I found an interesting piece on Chicken Buses called “LA CAMIONETA: The Journey of One American School Bus” which offers a rather fascinating account of how the school buses arrived south of the border as well as some rather grueling facts about the dangers Chicken Bus drivers face. I was warned to never take a bus at night yet I met plenty of young travelers who did. Not sure how their trips ended up but hopefully they were safe. 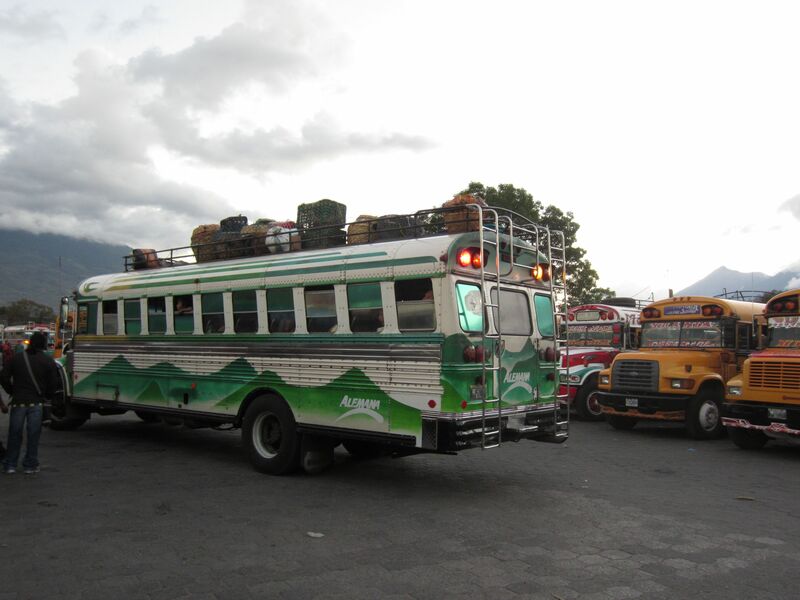 Above is my first sight of the Guatemalan Chicken Bus! 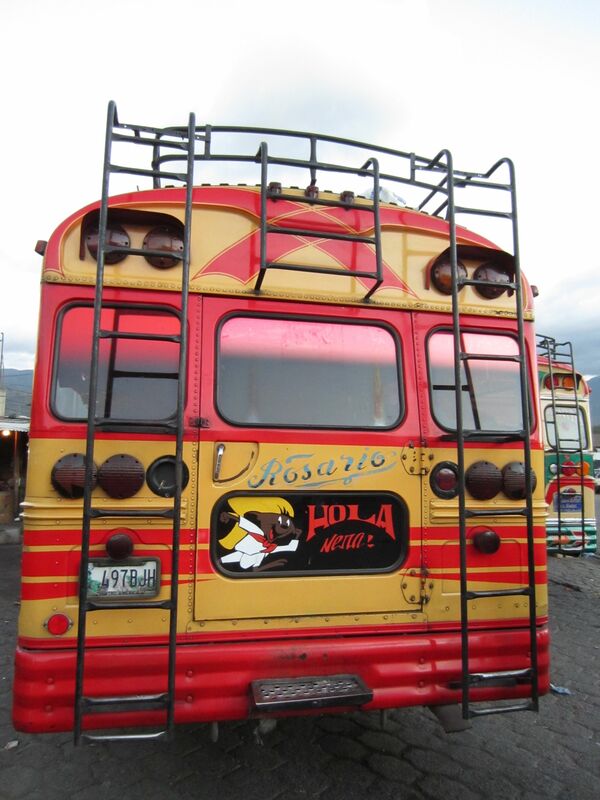 I had heard so much about these old American buses that were shipped south of the border and then painted in an elaborate spectrum of colors. My fabulous hosts informed me that each bus is color coded for its destination. Pretty clever! 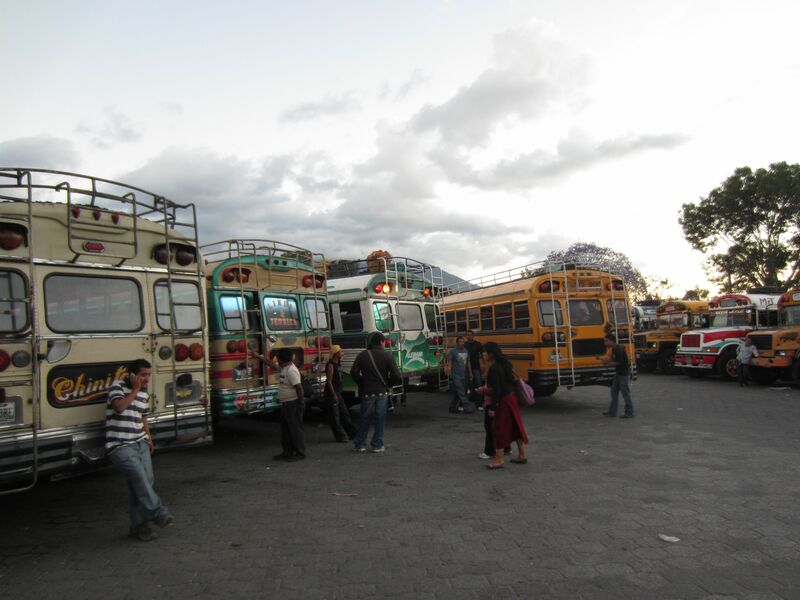 Given my fascination with Chicken Buses, it was a fantastic surprise when by chance I found the main bus depot in Antigua! It was getting late and Lucy and I were completely exhausted after eight hours of walking around town, sightseeing and taking 500+ photos each. There was one last thing I dearly wanted to see in Antigua before I left: The mercado (marketplace where the locals sell their wares). By the time we got to the mercado, however, we were both too worn out and overstimulated to enjoy it and it was shutting down for the day. The crowds were overwhelming, the noise loud and we just wanted to get out of there and grab a beer. Lucy and I headed to the nearest exit and lone behold, there it was, the Chicken Bus Depot. I was in absolute heaven! I think Lucy thought I was mad but oh well. Sometimes the truth hurts! I had to go hog-wild and take as many pictures as possible of my beloved Chicken Buses. Here are some of my favorites….hope you enjoy! Don’t I look happy besides the fact I’m standing in someone’s half-eaten lunch? It was six o’clock and busy busy busy at the Bus Depot. I had to be extremely careful not to get run over by all the buses backing out. They cared little about silly old me! A few of the un-painted fresh arrivals are in line. The good old orange and black school buses remind me of all the years riding them to school. Where did the time go? It feels like just yesterday when I was sitting in the back of the bus, wearing pigtails and Treetorns. This one is all ready to go. Wouldn’t want any luggage to fall off the top! These guys could not seem to figure out why on earth I was taking a picture of them. Little did they know it was the bus that I was trying to capture, not them. (he he). As the sun set, the lights went on and the Chicken Buses came to life and were electrifying the atmosphere. For some reason, I had to snap a picture of this bumper (below). 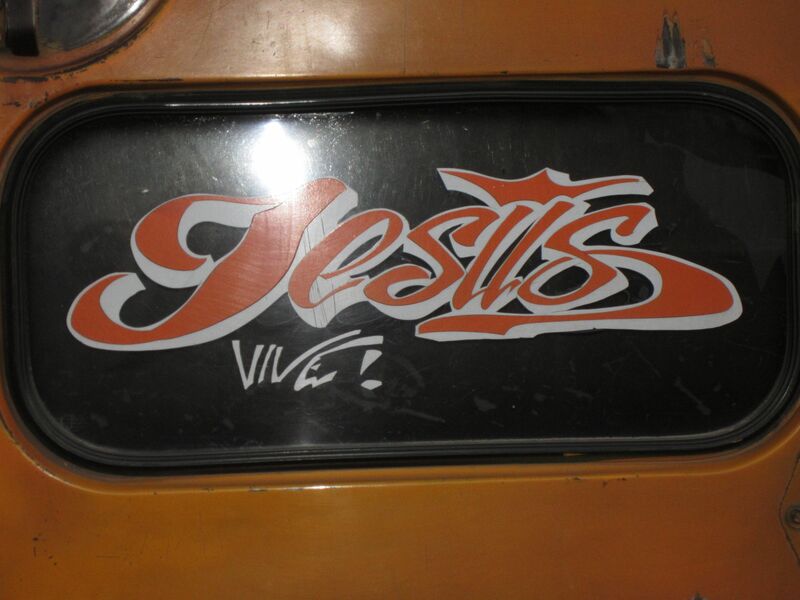 Got to love the fact that they are promoting Christianity on the back of a bus! After ten or so pictures it was time to quench our thirst and relax. It had been a very long day albeit extremely fun. Lucy knew just the right place to go, a bar with a rooftop view overlooking Antigua! 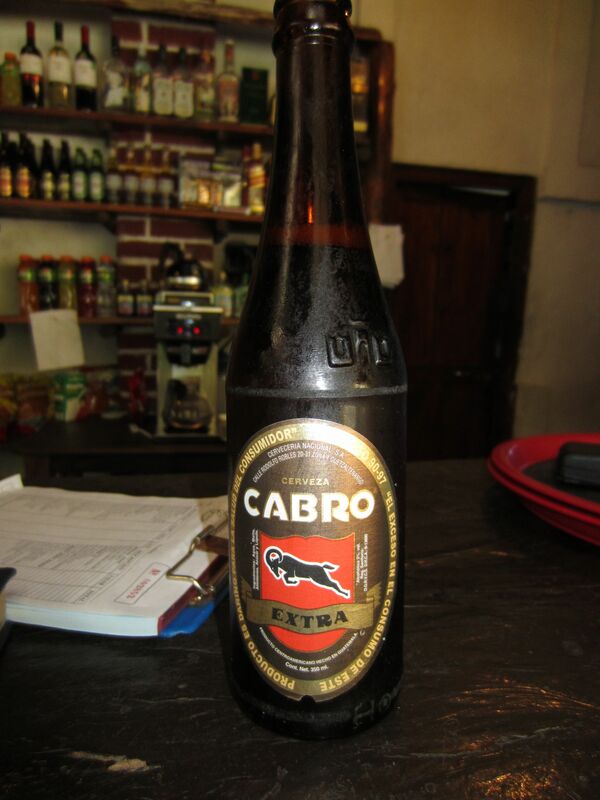 I could hardly wait for an ice-cold Cabro, the local beer. Stay tuned…views from the rooftop bar coming up next! The buses look like the pick-up truck taxis in Haiti. The name is escaping me at the moment, and they aren’t really taxis at all–but they are painted the same bright colors. Interesting! If you can find any pictures, I’d love to see! Very interesting, I’d never heard of the chicken buses before. Love the neon colors! 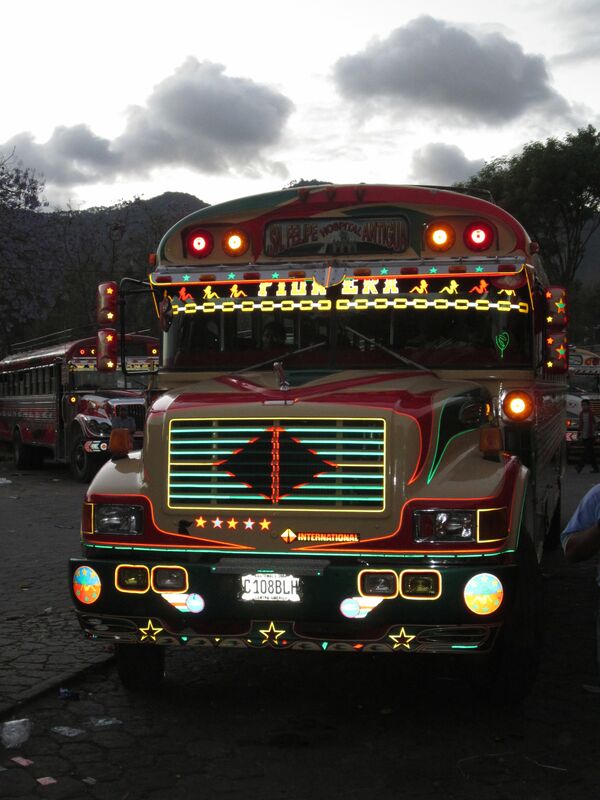 Did you see buses like this at all in Colombia? You got some great shots Nicole and no I didn’t think you were crazy! 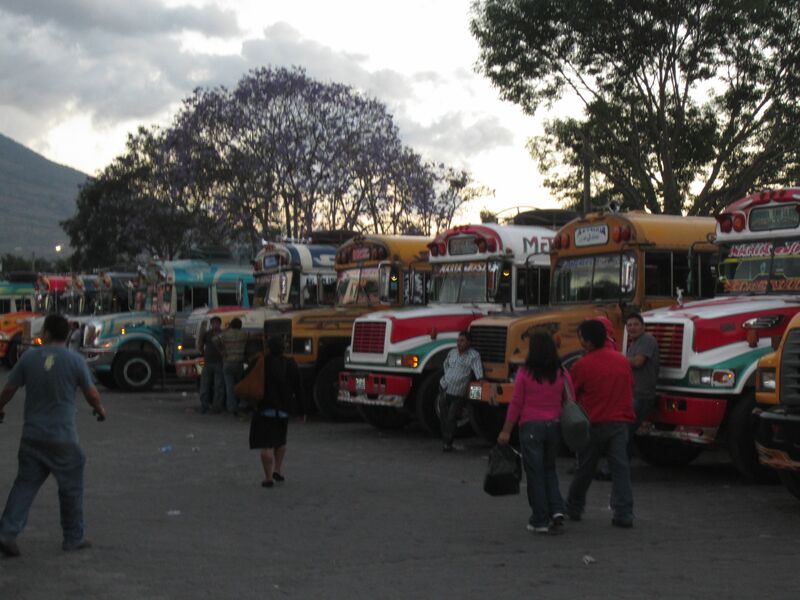 I love taking pics of camionetas too, I was just so exhausted by that point and was past ready to sit down. Many camioneta drivers drive like maniacs so there are a lot of accidents. They’re definitely not recommended after dark for that and other reasons. Love the colors, fun and excitement of these chicken buses. Back in the Philippines, we have similar buses not as colorful but just as exciting. It’s also a great way to learn first hand another person’s culture. thanks for sharing a post that breathes adventure. 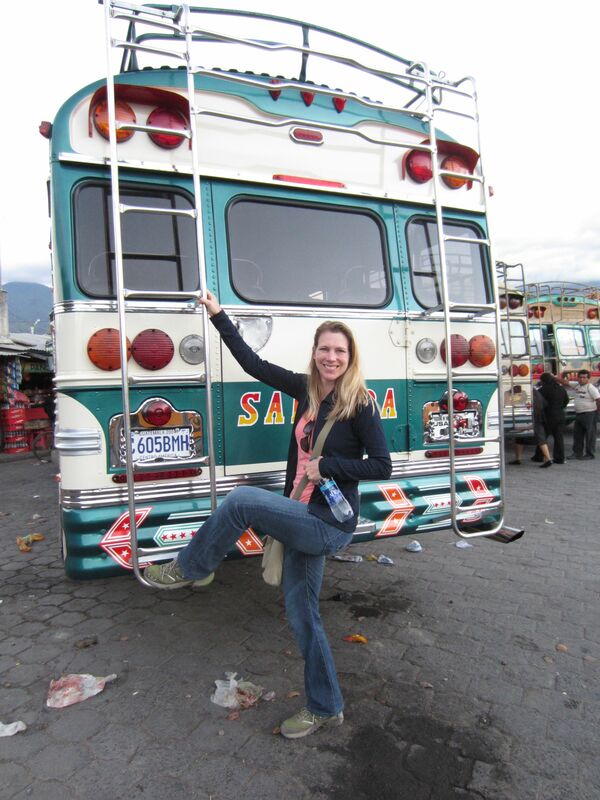 Seems like crazy, colorful buses are everywhere except here! Thanks for the comment! Yep! I’m sure of that! I loved the buses in Nepal too but was only in India for two days thus didn’t notice them as much as there was so much to notice!! !